The pageants arranged for the day were both entertaining and highly symbolic. One of them drew on the coronation of Henry VI as King of France in 1432, but the most touching one was the pageant that was an allegorical representation of the King’s parents, Henry VIII and Jane Seymour. Henry VIII was represented as a lion (a symbol of English Royalty) and the Tudor Rose, while Jane Seymour was portrayed as a phoenix, most likely because of an inscription that had been made on her grave: “here lieth a Phoenix, by whose death another Phoenix life gave breath: it is to be lamented much the world at once never knew two such”. According to Skidmore’s description, a phoenix descended from the heavens to land on a mount decorated by red and white roses and hawthorn bushes. A crowned lion then approached, followed by a young cub. At the cub’s appearance, two angels descended and crowned him with an imperial crown. The phoenix and lion then departed, leaving the crowned cub alone. Other displays along the route included depictions of Edward the Confessor, St George and “Truth”, a child representing the New Religion. The young king particularly enjoyed watching a tightrope walker, who balanced along a cable as he descended to kiss the King’s foot. The next day, at 9 am, King Edward VI travelled to Whitehall by barge. He was met by the guard and pensioners and then he walked to the chamber of the Court of Augmentations, where he put on his Parliament robes of ermine trimmed crimson velvet. The King then processed to Westminster Abbey for the Coronation ceremony under a canopy carried by the barons of the Cinque Ports. He was flanked by the Earl of Shrewsbury and the Bishop of Durham, and followed by John Dudley, William Parr and Thomas Seymour, who all bore his train. Behind them processed the Gentlemen of the Privy Chamber, the nobility, the pensioners, the guard and the court servants. Edward VI’s coronation was subjected to substantial revision and interpretation. He was the first monarch to be formally proclaimed king prior to his coronation and the Recognition and the oath were redrafted by his Privy Council. The most radical change of the ceremony was the considerably reduced role of churchmen, traditionally the intermediaries between God and the King. The ceremony itself was shortened because of the boy’s young age: instead of the usual twelve hours, it took “mere” seven. A dais had been erected in the richly decorated Abbey. On it was a throne decorated in damask and gold, with two cushions to help raise the small King. The ceremony started with Edward VI taking his coronation oath (promissio regis) on the Sacrament – the usual form since 14th century. After taking the oath, Edward was prepared for receiving unction. From 14th century onwards two special tunic-like shirts, one of white lawn, the other of red tartaryn, were worn by the Monarch for this part of the ceremony. The antiphon “Veni Creator Spiritus” was sung during the preliminaries to anointing. The task of divesting the King of his clothes in readiness for anointing was traditionally the prerogative of the Archbishop and/or other senior clergymen. For Edward’s coronation, the task fell to the Lord Great Chamberlain. Only two ceremonial tasks were assigned to clergymen: the Bishop or Dean of Westminster dried the anointed places with a cotton cloth and delivering the royal buskins (soft boots) and spurs to the Lord Great Chamberlain. Edward’s anointing was surprisingly religious, so to speak, because the coronation itself generally played down the notion of the King needing any additional sanctity. Edward received both chrism and holy oil on his breast, elbows, wrists, crown and, uniquely, the soles of his feet. This very thorough anointing was performed by the Archbishop of Canterbury who in his address to the King at the coronation strongly attacked the sacramental nature of the traditional consecration and unction, and denied Popes had the power to make Kings. Among other things, the Archbishop declared that the “solemn rites of coronation have their ends and utility; yet neither direct force or necessity” and that “the oil, if added, is but a ceremony”. Cranmer’s address also included a repudiation of the Roman Catholic Church’s authority over the crown, a discussion of the significance of coronation rites, the king’s duties ( which include emulating the godly King Josiah of Judah in banishing idolatry from the land), and a blessing on the king’s reign. Among other things, he said: “The bishops of Canterbury, for the most part, have crowned your predecessors, and anointed them kings of this land; yet it was not in their power to receive or reject them… Your Majesty is God’s Vice-regent and Christ’s vicar within your own dominions, and to see, with your predecessor Josiah, God truly worshiped and idolatry destroyed, the terrain of the Bishops of Rome banished from your subjects and images removed”. 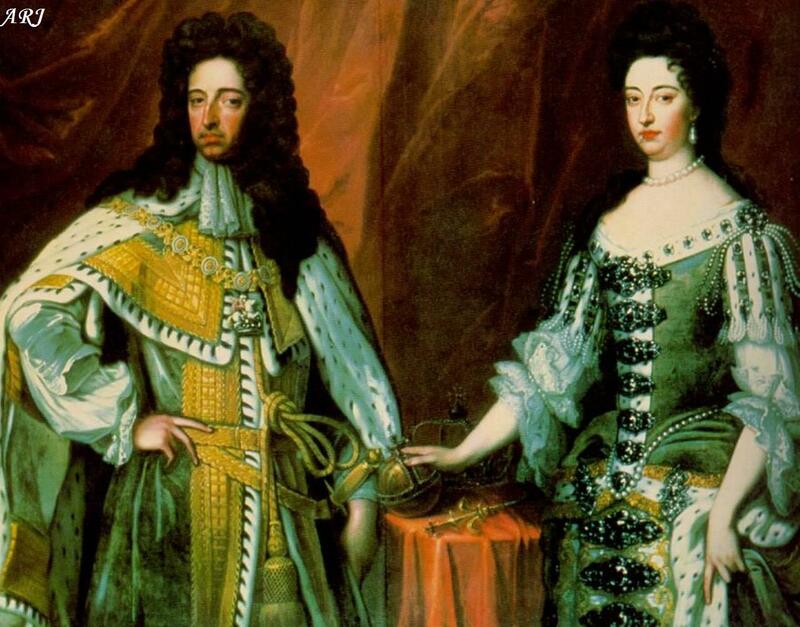 From the coronation of Henry IV, the oil used for the anointing ceremony was of a special significance. The oil allegedly came from the ampulla of St Thomas Becket (Mary I would later ask Charles V of the Holy Roman Empire to send a fresh, “uncontaminated” supply because she believed the oil had lost its sanctity because it had been used at protestant Edward’s coronation). As the oil used for the anointing was poured into an anointing spool and applied, the choir sang “Zadok the Priest”, which had been the traditional accompaniment to this part of the ceremony since the 10th century. 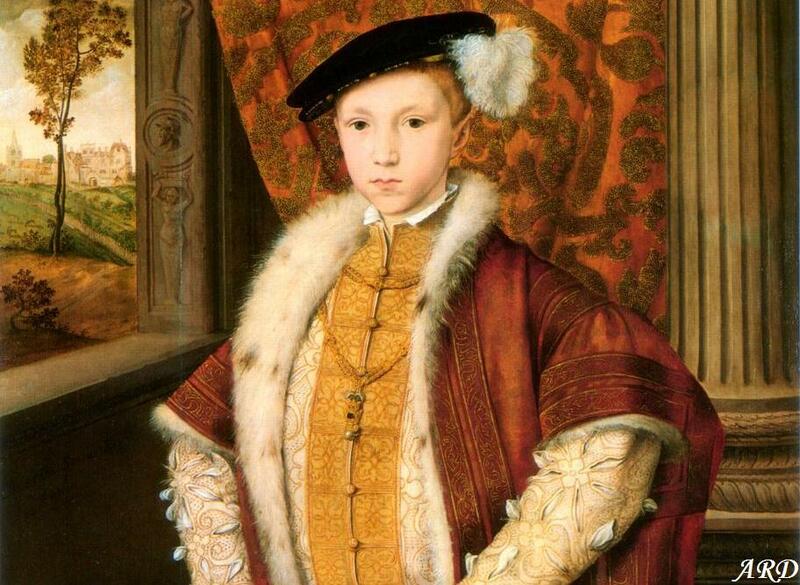 After the anointing the Monarch traditionally received the regalia and invested with St Edward’s robes, This tradition was however broken at Edward VI’s coronation, possibly because the robes were way too big for the boy King. Delivering of the insignia had been the responsibility of Churchmen for centuries but for Edward’s Coronation (which heavily played downthe role of the Church) the Archbishop assisted only in the crowning and did not deliver the other items of the regalia. While receiving the regalia, Edward VI mostly followed the accepted order: first, the spurs, followed by the Sword of Offering, then the bracelets, the armil, the mantle and orb. Next the ring was delivered. This is when another change occurred. The order for the coronation of Richard III stated that the ring should be put on the fourth finger of the right hand but it was changed to the fourth finger of the left hand for Edward’s coronation (although James I would later follow the example, all subsequent Monarch reverting to the right-hand custom). The actual crowning ceremony that ensued proved to be a complicated affair. With the exception of Richard I and Edward II, it had been the Archbishop who placed the Crown on the Monarch’s head. Edward VI, however, was crowned jointly by the Archbishop and the Lord Protector. Three crowns were in turn placed on his head – St Edward’s Crown, an Imperial Crown (not to be confused with Imperial State Crown made much later), and a small personal Crown. Trumpets sounded before each crowning. 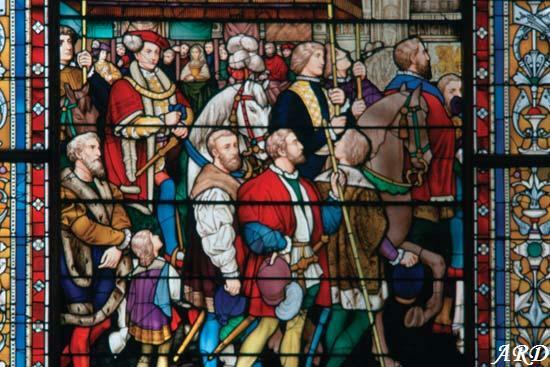 After the crowning, Edward received homage – a demonstration of loyalty from the assembled nobles and clergy. First, both Lord Protector Somerset and the Archbishop of Canterbury knelt down and kissed the King’s right foot and then, holding their hands between the King’s, kissed his left cheek. After that, each of the nobles and clergy kissed the young King’s left check and paid their homage by swearing allegiance to him. Once all aspects of the coronation were finally over the King, the noblemen and the clergy left for the Coronation Feast in Westminster’s Great Hall, followed by another feast at Whitehall. The feasts were in the best traditions of the excesses of the Tudor court with tables (on one occasion, literally) breaking under the weight of numerous dishes prepared for the event. One of the most colourful features of the coronation feast was the appearance of the King’s Champion. The office of Champion came into existence some time before 1327, although the precise date is unknown. As per tradition, the King’s Champion mounted on a horse made a dramatic entrance and issued a public challenge to anyone who denied the King’s right to the Throne. After no one was foolish enough to do so (no one ever did), the Champion than dismounted to kiss the King’s hand and join the feast. On the following Tuesday (called Shrove Tuesday), plays and masques were performed as part of the traditional post-coronation entertainments. The Revels’ accounts record payments for the “newe making and altering of Sundry maskes, and garmentes for players agenste the Coronacion of our soveraigne lorde Edward the Sixth”. Players included children and gentlemen of the Chapel Royal, and even King Edward himself. The exact nature of the play is unknown but we do know it featured Popes, Cardinals, Priests, and Monarchs, so I daresay it was quite an amusing experience (although probably not if you were a priest, cardinal or the Pope). 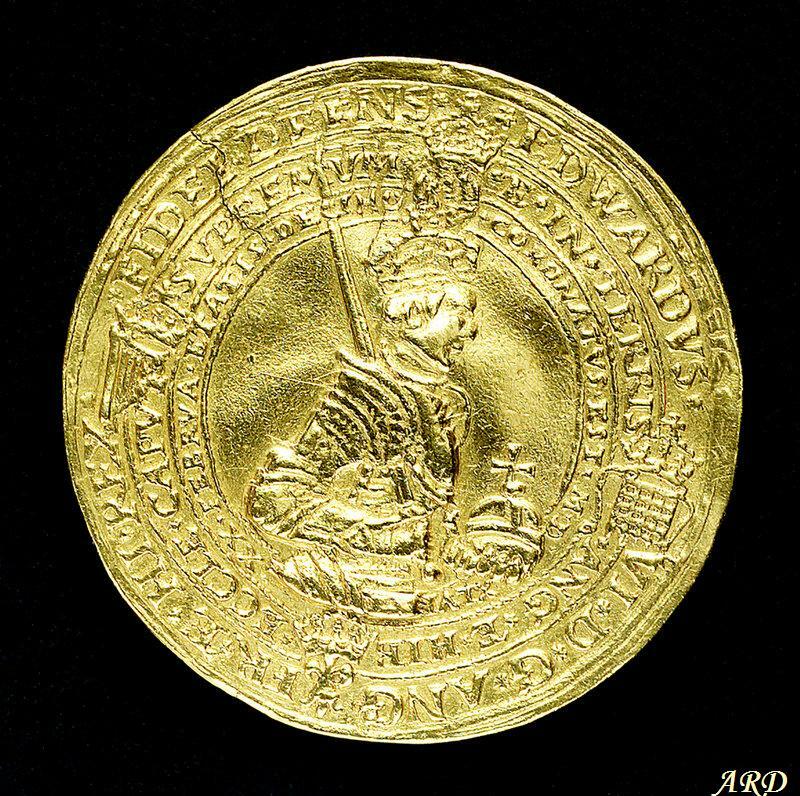 Edward VI’s coronation was also commemorated with a gold medal – the very first coronation medal produced in England. The translation of the Latin inscription reads “Edward VI by the grace of God King of England, France and Ireland, defender of the Faith and the supreme head on Earth of the Church of England and Ireland, crowned 20 February 1546 at the age of ten years’. The same inscription appears in Greek and Hebrew on the back. Despite his young age at the Coronation and brief age, Edward’s reign was a defining moment in English history. Edward ascended to the Throne of a country still undecided in its religious sympathies, but left a state that was strongly (and, as it would turn out, permanently) Protestant.